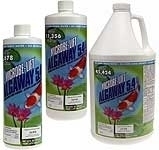 Control algae growth and eliminate green water in your self contained ornamental pond with Microbe-Lift Algaway 5.4. 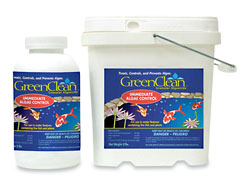 This product is safe for use with fish and plants (not snails, shrimp and crustaceans) and will keep your water surface clear and beautiful. For ponds with heavy algae growth, first clean off excess algae from the sides of the pond and any ornaments or water features. Then add 1 capful per 60 gallons of water for complete algae treatment. Help your water stay clean and clear with Algaway 5.4. When treating ponds with fish be sure it is well aerated.